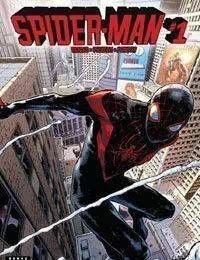 Miles Morales has been doing the super hero thing for a while, now, but after SECRET WARS, hell be a full-fledged member of the Marvel Universe. Swinging next to The Invincible Iron Man, The Mighty Thor and the All-New Captain America as a card-carrying member of the Avengers is an adventure, but its not all fun and games for New York Citys main Spider-MAN! What happened in the eight month gap? It all starts in SPIDER-MAN #1!